The laser fiber, which is only about as wide as a couple of human hairs, is inserted between the gum tissue and your tooth, where it painlessly removes the noxious elements that cause gum disease. You don't have to worry about bleeding, stitches or post-treatment infection, because your gums haven't been cut. It's an infection of the gums. It starts out as plaque, an opaque film on the teeth that hardens to form calculus or tartar. As tartar accumulates, it harbors bacteria which attack the soft tissue around the gums. This early stage of gum disease is called Gingivitis. Symptoms include red swollen gums, bleeding, bad breath and, sometimes, an unpleasant taste in the mouth. Untreated, Gingivitis becomes Periodontitis. At this severe stage, bacteria destroy both the gums and the supporting bone structural Pockets form where teeth are separated from the gums and surrounding bones. Left untreated, Periodontitis eventually results in tooth loss. What's the best way to treat Periodontal Disease? What's different about LASER PERIODONTAL THERAPY™? LASER PERIODONTAL THERAPY™ uses a special kind of laser called the PerioLase®. The laser fiber, which is only about as wide as a couple of human hairs, is inserted between the gum tissue and your tooth, where it painlessly removes the noxious elements that cause gum disease. LASER PERIODONTAL THERAPY™ doesn't take much time at all -- just two two-hour sessions versus six to eight one-hour sessions with surgery. You don't have to worry about bleeding, stitches or post-treatment infection, because your gums haven't been cut. What about recovery - will I be in pain or need to follow a special routine? The sense of recovery is immediate, due to the laser's ability to seal blood vessels, lymphatics and nerve endings. Of course, your tissue needs time to recover, regenerate and heal over the course of time, but after LASER PERIODONTAL THERAPY™, you can drive your car, go back to work, or do anything else you like. I can see how good LASER PERIODONTAL THERAPY™ is - but is it very expensive and will my insurance cover it? The good news is, LASER PERIODONTAL THERAPY™ is actually less expensive -- by about 20% -- than periodontal surgery. There is no special code for our therapy, so if your insurance company will reimburse for conventional surgery, they will reimburse for LASER PERIODONTAL THERAPY™. My doctor said he'd have to pull my teeth because they are so loose and I don't want to do that. Can you help? We have been able to save a lot of teeth that other dentists wanted to extract. We have had great success in saving teeth that were to be extracted. There is nothing better than your own natural teeth. We can schedule a consultation for you at NO CHARGE. I had x-rays a while ago. I don't want to take them again. Can't you look at those? That depends on their age and quality. The conditions of your mouth change rapidly, and in order to accurately diagnose you, we will need current high quality x-rays. We take digital x-rays. These use up to 90% less radiation than conventional film based x-rays. We will only take the minimum necessary and only after you are examined to see exactly what is necessary. How much more is the laser? I've been told that it is expensive. 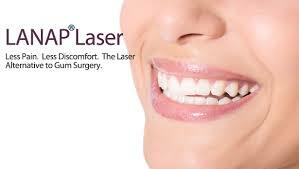 The laser is comparable to the fee for conventional periodontal surgery. It is not more because it is new technology. Our fee has actually been less than many of the offices using the conventional technique. How will I feel after the laser surgery? You may experience some ache, throbbing or soreness. The doctor will prescribe some antibiotics and an anti-inflammatory to take care of any discomfort you may experience. Usually two treatment visits and a couple of post-operative visits. The doctor will then prescribe visits with a hygienist every three months to keep up what he has started. We offer Care Credit Financing. It is a credit card for medical as well as dental services. It is easy to qualify for, and if you'd like, we can mail you an application. Many patients are surprised that they can have a very low monthly payment and treat their gum disease. How do I know this will work? I had surgery in the past, and I now need it again. The doctor can answer all of your questions regarding treatment. LANAP gives better, longer-lasting results than conventional surgery. In fact, 98% of LASER PERIODONTAL THERAPY™ treated patients remain stable after five years, a significant increase over traditional periodontal surgery. Dr. Eidman will examine your mouth thoroughly to determine if the laser is right for you. You can meet the doctor and staff and have a demonstration of the laser performed for you. He will discuss all your treatment options with you as well as the pros and cons of each option so that you can make the treatment decision that you feel is right for you.